also worth noting: the us is on track to have the coldest spring (mar-may) in over 100 years. seems odd to attribute anyhting from this spring to global warming. I don't blame the politician anymore. For every Fran Pavley, there are tens of thousands, if not hundreds of thousands of people who really think Fran Pavley (Education major) has the power to change the weather, and or end forest fires. I have to wonder if Fran Pavley was a Ventura County resident back in the 70s when an almost identical fire burned largely the same acreage. The similarity made the front page of the LA Times. Southern California has had a very dry rainfall season. High pressure has continually nudged Pacific storms to the north. I haven't checked, but I'll bet Seattle has had a very rainy winter/spring. A few years back, we had a very wet winter...and Seattle was in drought. At the time of the Springs fire, the temperature was 95 degrees, with relative humidity below 5% and gusty winds. This is why the brush was ready to burn, at an unusual time of year. But it's not indicative of climate change. Fran Pavley is a joke. She is not representative of conservative Ventura County. 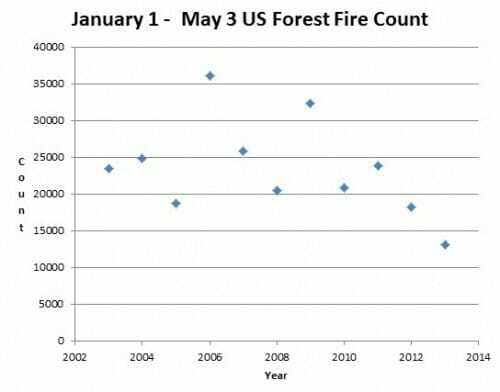 By the way, looking at fire data, in May, is not particularly useful. Any fires that have burned in the first 4 months of the year probably burned in the state of Florida. 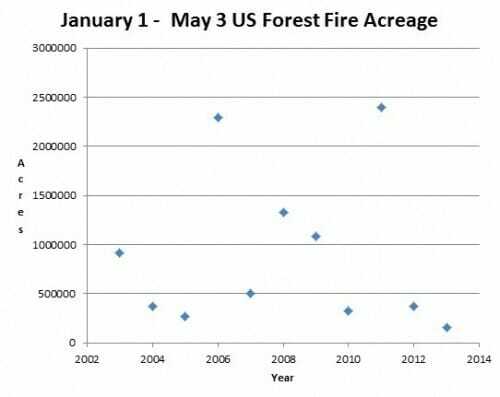 The fire season in the West is just getting started in May. Check back in August, and we'll have some useful numbers for comparison. Acreage will probably still be down, because the storm track was over the forested areas of the West. But California has the potential to burn. My prediction is this will be an historic fire season in California. Live fuel moisture in Southern California is already at August norms.